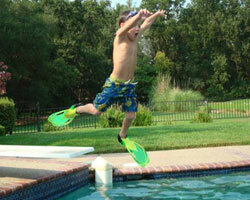 Clear Water Pools services the pools and equipment of a number of Carmichael homeowners. One of the best reasons to hire a pool care professional to care for your pool is the time it saves. Who wants to spend hours each week, caring for your pool water, keeping it clean from debris, checking equipment, and making sure chlorine levels are safe and effective? For many Carmichael pool owners, it makes complete sense. While it may seem like you are saving money handling chemicals and cleaning on your own, one thing the typical homeowner can’t perform is equipment maintenance, and it is maintenance that makes all the difference. The typical pool care expert may notice small problems before they turn into bigger ones, and fix them. This extra set of expert eyes looking at your pool and equipment alone is worth the added expense of hiring a pool company, let alone, the time saved during cleaning and chemical service. If you live in or near Carmichael, Citrus Heights or Orangevale and would like to schedule pool service, please give us a call at (916) 425-5299 today. Call Clear Water Pools at (916) 425-5299 to handle all of your Carmichael pool care needs.